The most commonly used format in audio applications is the 3 pin XLR. Originally produced by Cannon Electronics, and released as the Cannon X range, this led to them being known as ‘Cannon’ connections. The second revison was the Cannon XL (featuring a locking switch) and the third, the Cannon XLR. Thus, this connection became known as an XLR. The XLR is used across a broad range of musical and audio applications, due to the fact that it is both balanced, and a very secure connection. As a general rule of thumb, female XLR plugs usually receive output signals from devices (a microphone, for example), and male XLR plugs are generally used to plug into inputs (a mic pre-amp on a mixing desk, or active studio monitors, for example), with male XLRs plugging into female sockets and vice versa. As a result, he most commonly used XLR cable is the trusty mic lead, featuring a female XLR plug on one end and a male XLR on the other. Common uses are for mic cables, monitor speakers, audio interfaces, PA applications and much more besides. A balanced system is used in pro audio systems (xlr wiring diagram shown below), with an overall screen covering a twisted pair. Pin 2 on the XLR is ‘hot’ and carries the positive going signal, whilst pin 3 is ‘cold’ and provides the return. Any interference that penetrates the overall braided screen affects both the ‘hot’ and ‘cold’ wires simultaneously, and due to the balanced transformer or electronics at the pre-amplifier is effectively ignored as the pre-amp only amplifies the difference between ‘hot’ and ‘cold’ (a differential amplifier). The female XLR uses the same pin numbering but pins 1 and 2 are reversed . 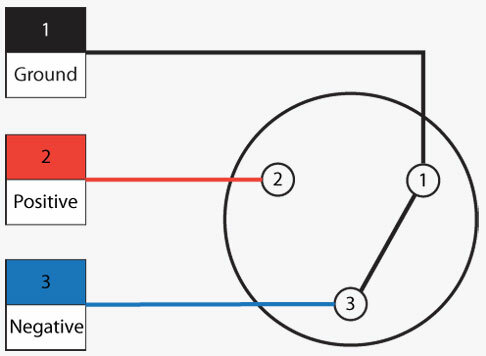 The unbalanced system is used for high impedance microphones over short distances, and is not recommended for professional use as it is susceptable to RF noise – such as mains power sources, taxi radios etc.